Are we to assume that our mayor, our leader in the reduction of fossil fuels and exhorting of others both public and private to reduce our carbon emissions, was driving in convoy with his wife, using 2 vehicles one public and one private? And that the mayoral car was being used as a second vehicle by the wife of the mayor? A breathtaking example of making rules which apply to other people, likely lacking any moral authority. Oh hush, Hilary. They tried really hard not to set a bad example to us ordinary people, even after the unforeseen “event”. Look how well the news of this was kept quiet, when normally even a small fender-bender qualifies as news without so much as a broken fingernail to add human interest impact to the headline. I think someone deserves high praise for unstinting efforts to keep this matter from giving us peasants the idea that concerns re fossil fuels and Climate Change are at best halfway sincere. 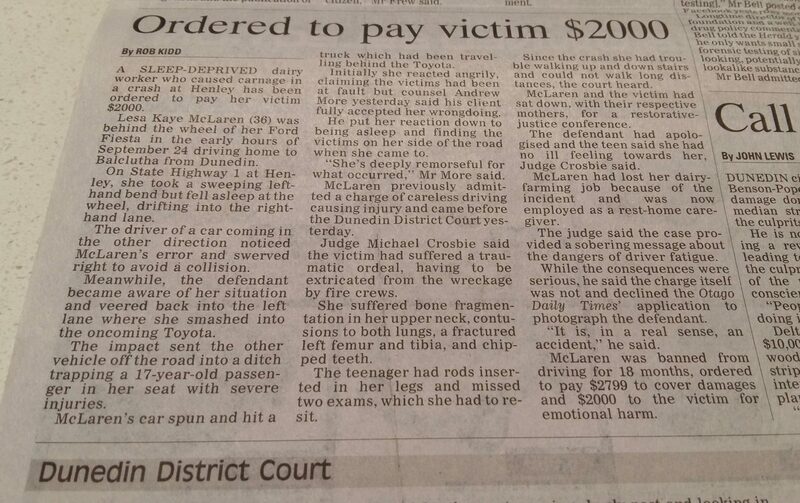 1 How come this serious injury accident was not reported by the ODT as would any other similar incident? 2 If the ODT didn’t know about the incident, how come? 3 Did the Mayor or any DCC staff influence in any way, the reporting of this incident by any means? 4 Were any emergency services that attended this incident influenced in any way by any communication or request by any party not to report this incident? 5 If it is correct that the Mayor’s wife was driving the Mayoral car and that the Mayor was driving his private car, then why? 6 Can it be clarified just what the arrangements are with the private use of this vehicle? ie does the Mayor have to fill in a vehicle running sheet for every journey made like any other similar organisation, or does the Mayor have carte blanch use? Any obfuscation leads to further theories that will only be fixed by telling exactly what happened, when, where and how and by answering the questions of any suppression of these facts by anyone. Hitting below the belt to subject family members of elected reps to public political commentary, I think. And not in the public interest either, as it might deter good people from becoming candidates. That is your opinion, Diane. But I suggest probably not the majority’s where ratepayer funds and media coverage are concerned. Every other member of the public is exposed to road crash reporting – this is not hallowed ground, for anyone. If NZTA can press the point about maintaining driver safety…..
And they do, they advise if you’re tired stop and have a rest. Holiday times are often stressful, so much to do, so many obligations, then the stress of organising what you’re taking on holiday and who’s looking after what at home. By the time you get into the car and head away there’s a kind of sigh, it’s all done and now it’s holiday time, adrenaline that’s kept you rushing for weeks subsides: it’s a prime time for over-ridden exhaustion to come to the fore. No way, Diane. “News” contains just about every car accident in the province, farther afield when there’s good photos. All those drivers and passengers are somebody’s family, and names come out when there is a court case (careless driving, speeding, DUI). In this case it was OUR vehicle i.e. from our rates (more accurately, debt incurred in our name I expect, for which we ratepayers are ultimately responsible) which makes it of public interest in this rating area. If it deters good people from driving when they are too tired, if it deters people from being profligate with fossil fuels by sharing a ride to the same destination, if it gives driver and passenger the opportunity to change places when one feels sleepy or unwell – these are all desirable outcomes. Good candidates are people who are sensible in and out of work hours, otherwise we would have no worries electing people who have a record of running their own businesses into bankruptcy, indulge in family violence in their own time, etc. The more we know about hopefuls putting their names forward for election the better our chances to pick the ones who won’t make dumb decisions during “work hours” on Council. Disagree. Not public political commentary at all. Someone decided that it would be OK for the Mayor’s wife to be driving the new mayoral car. That someone seems like to have overlooked any extreme tiredness factor. Lack of judgement? But by far more important are the questions round suppression of any news. Did it happen? Who was involved in any suppression? Why? Any other serious injury accident right in the holiday period involving falling asleep at the wheel would have made the news – this one didn’t. Who made sure it didn’t? Diane, we’re trying to deter bad people, ones who make false judgements, hypocrites, social zealots, non transparent. Just what good people have stood? It will be a lot shorter list than the troughers.. I wouldn’t think for a moment that Elizabeth means that any actions of Dunedin!s First Lady were inappropriate in any way. Nor would any of us, I am sure, wish her anything but a speedy and complete recovery. It must be horrible to wake up in hospital having been driving if that is what happened. And no fun either for our Mayor. A worrying time for all. The comments made have been about the Mayor using a car provided by the City as a second car to travel recreationally, with a big carbon footprint, and why the ODT either did not know or hid that a DCC car had been written off and the circumstances. I totally agree. It isn’t so much about the accident and who was driving, but about why it was never reported in the paper. Every other accident gets reported and the fact that a 5 day old vehicle got written off would surely have made it news. If a 5 day old truck or bus or boat or tractor got written off it would surely have made the news, regardless of who owned / drove it. And road accidents in Central Otago are very topical at the moment. So why was this not reported? Is there any way of asking the ODT for an explanation? As far as I know ODT and Central Otago media were unaware of the road crash. And thus why I made an official information request. So, if the media weren’t aware then it starts to smell a little more. The normal process is for the reporting staff to ring emergency services and ask for details of activity. Some emergency staff provide logs of call-outs etc. There must of been Police, ambulance, fire most likely all in attendance and somehow all this detail didn’t make it to the mainstream media. There are only a couple of logical conclusions that can be drawn. One is that all of these emergency services all failed to respond to media requests on this particular incident. It would be unthinkable that influence was bought to bear on emergency services to not report an incident wouldn’t it? What about the Otago Rescue Helicopter Trust? They usually attend serious accidents in Central Otago. Comments are now closed. 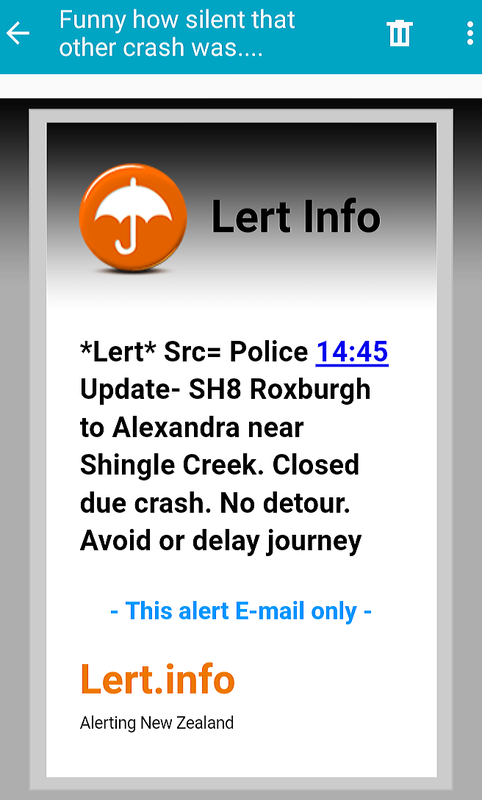 Further information can be obtained via official information (OIA) requests to emergency services or NZTA. Elizabeth, it is curious that the media were unaware of this accident involving serious injury. All accidents involving injury are required to be reported to the police. The police have regular meetings (at least weekly) with the media. So was this accident reported to the police and if so why did the media not hear of it? Why would anyone not want it reported? And yet nothing for our Santa Fe numero 1. God works in mysterious ways. And must bring into question police enquiries into 152+ cars missing from the DCC. Wed, 28 Jun 2017 at 3:36 p.m. I feel that the NZ Police have been getting increasing publicity over their actions or inactions over events that may prove “difficult” for public figures. I think it started with Auntie Helen’s mad dash in a car to get to some infernal rugby match. But there have been many instances since. Lots round the financial shennagins over the ORFU involvement with pokies in Auckland, and now of course we have Bill telling porkies all over the place over that little tobacco coot from Clutha/Southland. The police had a ten month investigation into the illegal recording allegations but were stymied at every turn. Can you imagine the little hints given at the highest level?